Attached are two scans of a dish I have. Any info you could give me would be greatly appreciated. The dish was given to me by my aunt, who worked at the Finnish embassy in Beijing during the 50s. Your dish is of Chinese porcelain and of a type regularly supplied to the Imperial Court. They were manufactured throughout the 19th century after models created in the Kangxi period. 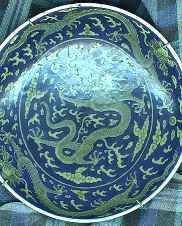 Your dish seems to me to have been made in the Xianfeng period or up until the early years of the 20th century. Since none of my reference sources shows the foot of the dish like your pictures does, I can't form any firm opinion. The mark is of a very high quality though, and a Xianfeng (1851-1861) period mark. I can't actually see any real reason to doubt that it is also of the period. You will find the mark reproduced at the marks section of this site. 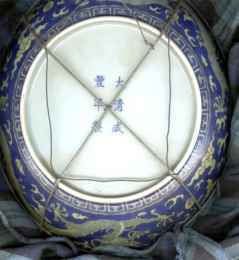 Pieces from this period is exceedingly rare since the Imperial Porcelain Factory was burnt and destroyed in 1853 during the Taiping rebellion. You will be able to find more information on this, at my Chronology and History of China pages, under the "Qing Dynasty". Please note that this message is not a final confirmation of the date of your piece. I only want to tell you that there is a possibility that your piece is very rare, and in good condition might be worth a considerably amount of money. The final decision on this must be made by an expert who are able to handle the piece. I would recommend the Oriental Ceramics Department at Christie's or any major international auction house. In the mean time I suggest you utterly carefully remove and throw away those metal hingers. This information is given as an example of private conversation only and is not intended to be used as a promotion of any individual piece. All opinions are the authors and are given as such with all hazards of judging anything from a photo. Copyright © Jan-Erik Nilsson, Göteborg 1999.